Study Business Management with Marketing (top-up) at Harper Adams University - Which? Why study business at Harper Adams? Everyone needs a business education. Whatever career you follow it will almost certainly involve some ‘business’. From manufacturing to marketing, food to finance, you need to develop and manage business opportunities to create wealth and well-being, prosperity, jobs and choices. At Harper Adams we prepare you for a successful career in a wide range of industries. We give you not just the knowledge, but the skills to put it into practice in the real world outside the classroom. Through lectures and tutorials led by commercially experienced staff you will learn to think critically, solve business problems, analyse company finances and investigate new markets. About 70% of the UK's land area is given over to agriculture, so this is a subject representing an important part of the country's economy. Typical starting jobs for graduates in agriculture include agricultural science, farming and farm management, but graduates also go into other areas, such as the horticulture trade, auctioneering and conservation. Agriculture graduates are also in increasing demand for one of the hardest-to-fill jobs in the country - surveying. 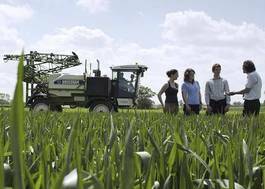 Jobs for agriculture graduates are often in rural areas - in 2016, areas like Essex, Lincolnshire, Staffordshire, Suffolk, Yorkshire and Kent were all important for agriculture graduates.